Q1: Study source 1. What is Eadwine doing? Why were monks doing this task less important during the Tudor period than previous centuries? A1: Eadwine is shown as a scribe producing the text of a book. This painting is in fact inaccurate. He is shown writing directly into a bound volume. We know that medieval books were, instead, written page-by-page, then assembled into a book after completion. This work was usually done by monks living in monasteries. The invention of the printing press by Johannes Gutenberg around 1440 reduced the need for handwritten books. Q2: Read source 2. 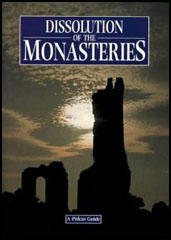 Explain why there was a decline in the number of monks and nuns between 1350 and 1500. It will help you to read about the Black Death before answering the question. A2: The Black Death arrived in England in September 1348. The author of source 2 points out that the disease killed an estimated 50% of all monks and nuns living in England. Q3: Study sources 3, 4, 5 and 6. What criticisms do these sources make of the monks and nuns? A3: These sources make several criticisms of the monks and nuns. This includes: drunkenness (Lincoln, Pershore); gambling (Lincoln); monks fathering children (Bradley); nuns giving birth to children (Lampley, Lichfield); monks selling monastery timber (Peterborough, Abbotsbury); homosexuality (Leicester); monasteries not providing beds for travellers (Peterborough); laziness (Peterborough); criminal activity (Whitby). Q4: Study sources 8, 11 and 14. How do these images help us understand what happened to the abbeys after they were closed down by Henry VIII? A4: Lacock Abbey (sources 8 and 11) was sold to Sir William Sharington, who converted it into a house. Whitby Abbey (source 14) was just left and over the years local people dismantled it and used it as building material. Q5: Give as many reasons as you can why Henry VIII closed down the monasteries. You will need to read the introduction and all the sources before answering this question. A5: There were several reasons why Henry VIII closed down the monasteries: (i) He needed money because he was bankrupt (sources 9, 10, 12, 15 and 16); (ii) By selling off the monastery land for low prices he gained the support of the people who benefited from these sales (source 13); (iii) It was an attempt to stop monks and nuns being corrupted by their growing wealth (source 2); (vi) Henry VIII wanted to punish monks and nuns for their immoral behaviour (sources 3, 4, 5 and 6); Henry VIII wanted to show the Pope that he was now the head of the Church of England (source 7, 12 and 16). Q6: Study your list of reasons why Henry VIII closed the monasteries. Select those reasons that were (i) the most important to Henry (ii) the least important to Henry. Historians generally take the view that the corruption and immorality of the monks and nuns were not very important reason in persuading Henry to take this action. However, it is impossible to know the exact reasons why people behave in the way that they do.